This is among the best quotes I’ve ever gotten in my career as a journalist. Cody Christopher shared that gem with me when I met him in April 2015 for my initial story on Three’s Bar & Grill. 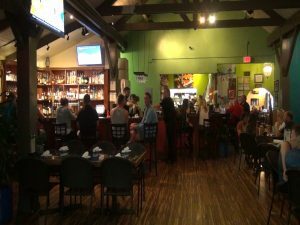 It was how the chef/co-owner described his experience of opening the Kīhei restaurant back in 2010. Hilarious, right? But this quote also comes with serious intention, as Christopher and co-owners Jaron Blosser and Travis Morrin have had to, well, Roll with the Changes (REO Speedwagon! ), especially over the last year. 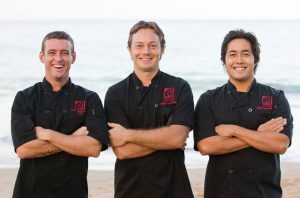 In July, the trio began a new business venture in Kīhei, opening farm-to-table eatery Fork & Salad in Azeka Mauka. Three’s catering operation was ramping up, with weddings, Pacific Whale Foundation boats and food truck events. Then, October 23 brought a shock: an early-morning fire, cause undetermined, in an unoccupied kitchen. 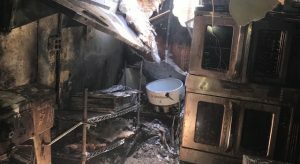 It destroyed a large part of the area used for catering, and left smoke and water damage throughout the rest of the kitchen and restaurant. Working countless hours alongside contractors, the three co-owners basically spent seven days a week getting the restaurant back in working order. All this, while having to maintain daily catering operations and their other restaurant. Loyal Three’s staff helped in all parts of the process. The employees were owners’ main motivation to get reopened as quickly as possible and keep everyone employed. 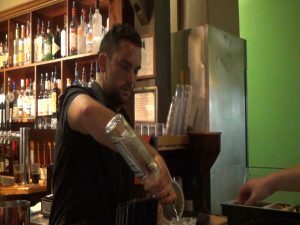 “We’ve had a lot of the same employees over the years and they’re like family to us,” says Blosser. 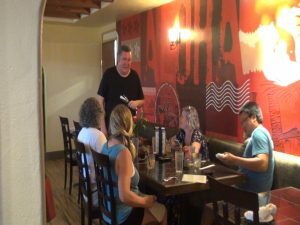 Those employees were ready and raring to go on November 30, when Three’s reopened the doors after what owners called “the most intense and stressful 40 days of our lives.” But getting the work done so quickly? That’s just the way they roll. “There’s people that say, ‘Can it be done?’ and I’ve learned with the three of us, it’s not ‘can it be done,’ it’s ‘how can we get it done, how can we make this work,'” says Christopher. 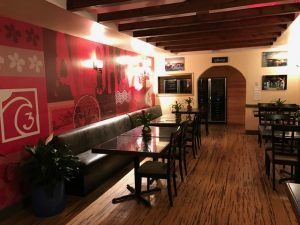 In addition to a shiny kitchen and new walk-in cooler, the restaurant was sporting a few changes like new paint, tile, a custom mural in the dining room and a revamped menu, premiering items like red curry clams and mussels, Ahi sliders and new sushi known as Marilyn Monroll. The place was packed. Customers new and old welcomed Three’s back to the community with Open Arms (yes, Journey song!). 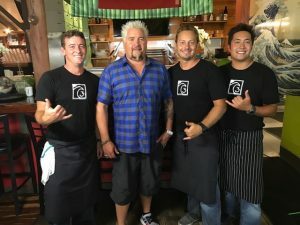 “Our customers, the Kīhei community, this island is everything to us,” Christopher adds. On Feb. 16, the owners took their reopening one step farther, planning a celebration to coincide with the restaurant’s 7th birthday. 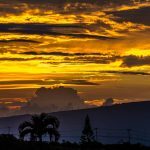 It included a Hawaiian blessing by Kimokeo Kapahulehua, all-day 25% discounts for diners and a matching donation for the Maui Arts and Cultural Center (MACC). Travis Morrin, Cody Christopher and Jaron Blosser, co-owners of Three’s Bar & Grill. And best friends. Photo by Kiaora Bohlool. 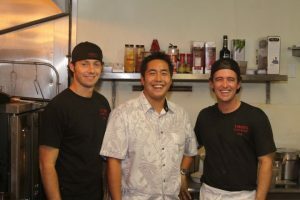 Three’s co-owners/ chefs back when the restaurant opened in 2010. Courtesy photo. 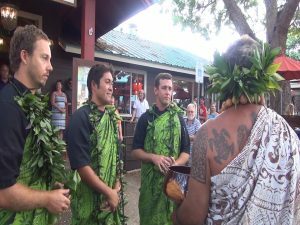 Three’s owners with Kimokeo Kapahulehua during a Hawaiian blessing. Photo by Kiaora Bohlool. Three’s bar and surf lounge. Photo by Kiaora Bohlool. 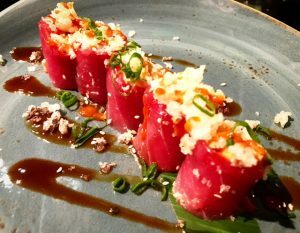 Ahi sliders, a new menu item at Three’s Bar & Grill. Courtesy photo. Server greets table in Three’s dining room. Photo by Kiaora Bohlool. 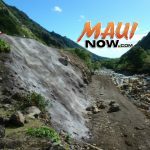 Three’s owners toss salt as part of a Hawaiian blessing ceremony on Feb. 16, 2017. Photo by Kiaora Bohlool. 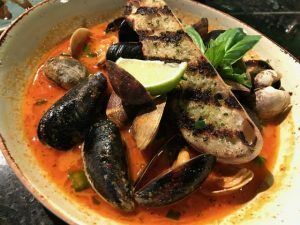 Red curry clams and mussels, a new menu offering at Three’s. Courtesy photo. Three’s chefs/co-owners Cody Christopher, Jaron Blosser and Travis Morrin. Courtesy photo. 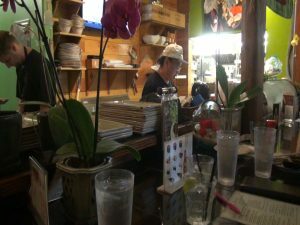 Marilyn Monroll, a new sushi offering at Three’s in Kīhei. Courtesy photo. Kiaora Bohlool outside Three’s Bar & Grill in Kīhei. Three’s bartender in action during the Grand Reopening. Photo by Kiaora Bohlool. 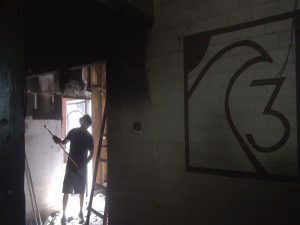 Three’s kitchen, damaged by the Oct. 23rd fire. Courtesy photo. Cleanup after Three’s kitchen fire. Courtesy photo. New wall mural in the dining area at Three’s Bar & Grill in Kīhei. Courtesy photo. Three’s sushi bar. Photo by Kiaora Bohlool. 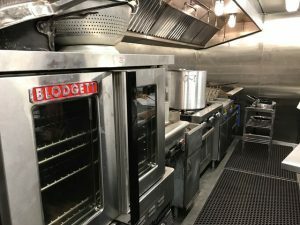 Three’s kitchen, rebuilt within 40 days. Courtesy photo. So what does the next chapter hold for these three? The next song to be sung, so to speak? Well, that depends on which one you ask. 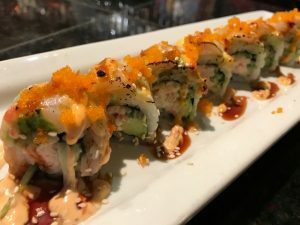 There have been many changes at Three’s over the years — expanding from around 20 to 75 employees, equipment upgrades, around 10 different menus, and rotating roles for the owners between cooking, sushi, managing, operations and finance. But what hasn’t changed? A passion for not just culinary arts but their island community, a knack for creative problem-solving, a firm grip on the power of perseverance. As Journey might say, they Don’t Stop Believin’. 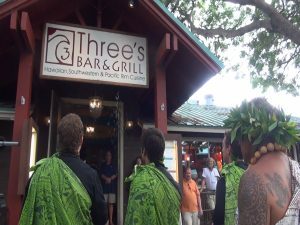 Three’s Bar & Grill is open for breakfast, lunch, happy hour and dinner at 1945 South Kihei Road. It also features a raw bar from 11 a.m. to close, live music daily and an award-winning happy hour twice a day. Learn more at Three’s website.